Stephen Jesse Jackson was born on the 5th April 1978, in Port Arthur, Texas USA, and is a retired professional basketball player, who played as a small forward in the NBA league from 2000 to 2014. Jackson started in the New Jersey Nets and finished his career with the Los Angeles Clippers, meantime winning an NBA title with the San Antonio Spurs in 2003. He was known as a journeyman, as he changed teams eight times during his rich career. His numerous contracts significantly increased his net worth. Jackson’s career started in 1997. Have you ever wondered how rich Stephen Jackson is, as of mid-2016? According to authoritative sources, it has been estimated that Jackson’s net worth is $25 million, most of his money he has earned by professionally playing basketball. Stephen Jackson was born and raised by his mother Judyette, a single parent who had to work two jobs in Port Arthur, Texas – Jackson helped his mom by working in his grandfather’s restaurant as a dishwasher and table cleaner. He went to Abraham Lincoln High School in his hometown, and led the basketball team to a state championship when was a junior. Jackson later switched to Oak Hill Academy in Virginia, and emerged as a significant talent. Stephen was ruled academically ineligible, and the University of Arizona rejected his application, so he went to Butler County Community College in El Dorado, Kansas instead, but stayed for only one semester. Subsequently the Phoenix Suns selected Jackson as the 42nd pick overall in the 1997 NBA Draft, but was waived without playing a single game. He went to play basketball in Venezuela and the Dominican Republic before finally getting his chance in the NBA. Jackson played for the New Jersey Nets (Brooklyn Nets) in his debut season 2000-2001 and averaged 8.2 points per game in 40 starts. Stephen hen became a free agent, and the Spurs acquired him for the 2001-2002 season, but he was injured for the most of the campaign. However, he was healthy the next year and contributed to winning the NBA Championship in 2003, primarily being used as the sixth man. After winning the title, Jackson was a free agent again and signed a two-year deal with the Atlanta Hawks, and had his best season to date in 2003-2004, averaging 18.1 points, 4.6 rebounds and 3.1 assists per game in 80 matches. He signed a new, improved deal; a 6-year, $38.3 million contract, but was immediately traded to the Indiana Pacers for Al Harrington. Jackson played well in his first season in Indiana, but was suspended for 30 games after fighting with Detroit Pistons fans in the stands during a match. He spent another season and a half with the Pacers before being traded to the Golden State Warriors in January 2007, but missed the first seven games as a Warrior due to a suspension for his legal problems. He finished the 2006-2007 season with 16.8 points, 3.3 rebounds, and 4.4 assists per game. The next two seasons were quite successful for Jackson, as he played a major role in the Warriors team, averaging more than 20 points per game in 2008 and 2009, but was then traded to the Charlotte Bobcats along with Acie Law in return for Vladimir Radmanović and Raja Bell. 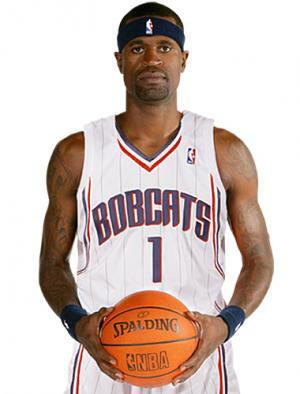 In 72 games (all starts) for the Bobcats in 2009, Jackson averaged a career-high 21.1 points and 5.1 rebounds per game. The next season was also good for him, but he began to decline in 2011 when he was traded to the Milwaukee Bucks as part of a three-team deal. On March 13, 2012, Jackson was sold back to Golden State where he didn’t play a game as only two days later he was traded to San Antonio. Jackson served as a bench player in the next two seasons before finishing his career in Los Angeles Clippers in 2014. Regarding his personal life, Stephen Jackson has been married to Renata Elizabeth White since 2009, and they have two children. Jackson has often had problems with authorities, having been charged for felony criminal recklessness, assault, two counts of battery, and disorderly conduct. He did his community service and became active in charity work, establishing the Stephen Jackson Academy of Art, Science, and Technology in 2008. Jackson also recorded a rap mixtape called “What’s A Lockout?” on 2011. Siblings Bianca, Donald Buckner Jr.